"I started losing my sight while working as an engineer during the 70s. 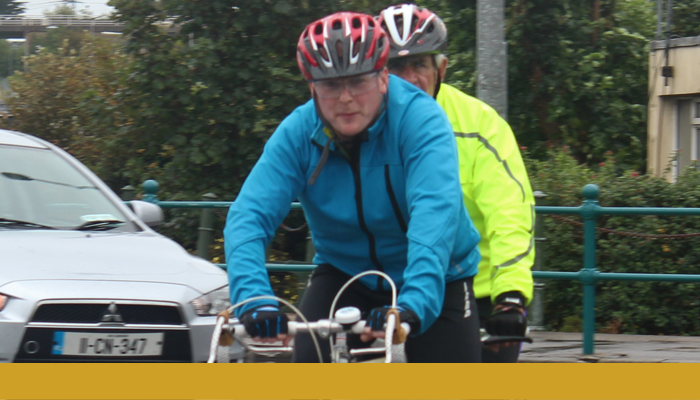 "I remember being advised by an RNIB staff member to keep myself physically fit. That advice was priceless. Fifteen years ago, some friends at work were talking about doing a Maracycle – Belfast to Dublin and back. By then I’d lost a lot of my sight, so couldn’t ride solo. Someone said, ‘I’ll be your pilot if you can source a tandem bike.’ I managed to get a tandem from North Down Cycling Club and discovered there was a blind tandem group in Bangor. We trained regularly, gradually increasing mileage and surprising ourselves with our success! After eight hours of pedalling, two broken spokes, nearly jumping on Alan’s shoulders when a lorry hooted at us, and enduring pouring rain, we arrived in Dublin. The experience made me realise blind people can do the same as everyone else. All we need is a willing, good pilot. And you’re quicker than most on a tandem!"